Recognizes native and denatured forms of RFP and its variants: tag-RFP, turbo-RFP, DsRed, mCherry, mOrange, etc. Synthetic peptide corresponding to Sea anenome RFP (N terminal) conjugated to keyhole limpet haemocyanin. Store at 4°C (add 0.1% NaN3) for several days to weeks. Our Abpromise guarantee covers the use of ab125244 in the following tested applications. WB 1/1000 - 1/3000. Predicted molecular weight: 26 kDa. 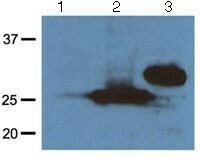 Sensitivity with ECL: 1-10ng of purified RFP or RFP fusion proteins. Publishing research using ab125244? Please let us know so that we can cite the reference in this datasheet. customer tried Drosophila with abs, but it didn't work. Does Drosophila make sense with this abs? It's tag-abs: Red Fluorescent Protein! Ich habe das Datenblatt noch einmal ueberprueft, und ich denke, wir haben uns missverstanden! Gehe ich richtig in der Annahme, dass Sie ein Protein mit dem RFP getagget haben, und dies hat nicht funktioniert. I´m working with the Neurophysiology department of University of Wuerzburg. A while ago we ordered monoclonal anti-RFP antibody (RF5R, ab125244). Unfortunately, the antibody isn´t working in Western Blots nor IHC experiments. So I was wondering if you could either provide us with an alternative antibody with the same properties or a different batch of RF5R, ab125244. I would very much appreciate your help on this matter.